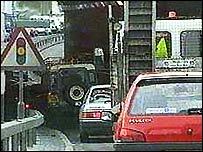 The morning rush-hour "tidal flow" which allows traffic to go the wrong way through the Blackwall Tunnel has ended after 29 years. Police and Transport for London said dangerous driving had led to the scrapping of the system in the tunnel under the River Thames in east London. The tidal flow allowed vehicles to travel north in the southbound tunnel. The southbound tunnel opened in 1967 as a relief route to the northbound tunnel, which had two-way traffic. TfL said it anticipated there would be an increase in congestion on the south approach to the tunnel as a result of the decision. David Brown, from TfL, said: "The safe and efficient operation of traffic through the Blackwall Tunnel is our primary concern. "The increasing number of near misses in this enclosed environment poses a significant safety risk and endangers lives." But Bob Neill, London Assembly Member for Bexley and Bromley criticised the decision. "The tidal flow system has worked well without any serious incidents for years tackling some of the worst congestion in London," he said. "Many of my constituents will today find themselves sat in congestion without having any idea why the suspension has been implemented."